University Hospital will provide comprehensive, seamless and innovative patient and family centered health care to improve the health status of the communities we serve. University Hospital will be the preferred area employer by offering an environment where employees and volunteers are personally and professionally valued, recognized and supported. University Hospital will be a clinical center of educational and research excellence by continuously evaluating and adopting innovative practices in technology and health care. by treating all with grace and dignity. to embrace diversity and inclusion. Consistent with our mission and values, Upstate strives to attract and cultivate diverse and culturally sensitive faculty, staff and students. 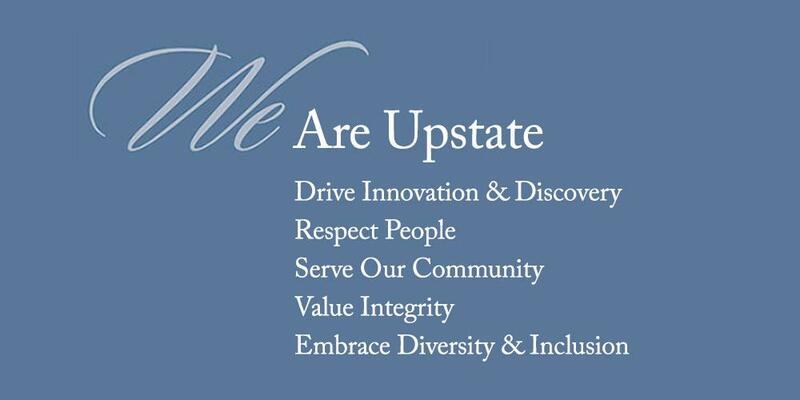 Visit Upstate's Commitment to Diversity to learn more. Last Modified: April 05, 2018. Contact Emily Kulkus with questions about the content of this page.